Note: You may remember Wolfie in the Dog Park from some time ago. Here he is at six-years of age. Today (April 8, 2013) Wolfie turned 5 years old. I still couldn’t believe that it has been 5 years since I picked him up from the Boise airport as a yelping little guy. He has grown to be a very loving and, as usual, manipulative companion. We definitely, either intentionally or unintentionally, help him be successful in being manipulative, that’s for sure!!! We made some homemade treats to give to his friends in celebration of his birthday. But unfortunately, it rained last night and the dog park is muddy. This means that everyone just stayed home and we were not able to give out his treats. We went to the dog park anyway since lightning is the only event that will prevent us from going to the park. We didn’t stay long (30 mins vs the usual 1 hour or more) to see if anyone would come but as I suspected everyone skipped today. We’ll try again tomorrow. Fortunately the treats have a long shelf life. I included a picture taken last Saturday at the dog park. 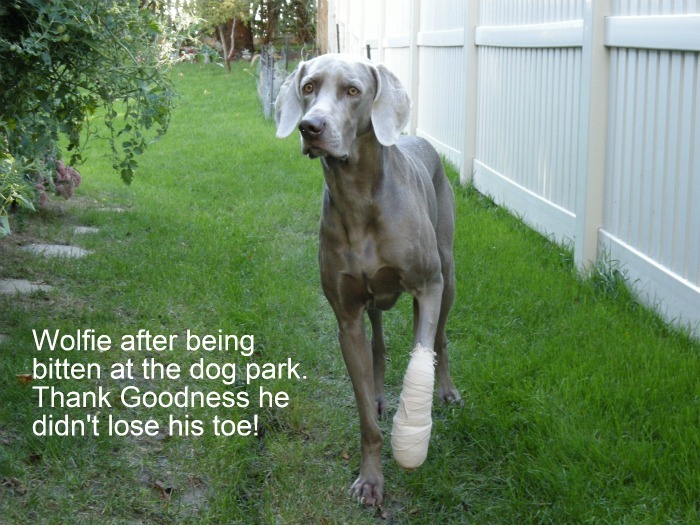 Note: The above photo was taken of Wolfie after he suffered a bite at the dog park. Click here to read his story. From Marcy: Wolfie is doing well and surprisingly, he is not as defensive at the dog park anymore. Sometimes I get nervous because he runs away from me and gets in the middle of a group of dogs who are just congregating and just wants to find out about the dogs that have come in. In the past this would have meant trouble because he wants to sniff but he does not want to be sniffed especially by male dogs. But now, even though he is apprehensive, he tolerates it and once he has met everyone, he searches for me and runs to me as fast as he could, seemingly happy about the introductions. Of course I am watching the whole thing and most of the time I just tell him that the other dogs are friends and for him to be gentle. This coaxing always works. Today, we can’t get out of the garage because of the snow and he has been crying because he wants to go to the park. I don’t know how long this crying is going to last. We have brought him in the backyard but the dog park is what he wants. Oh well, he’ll be disappointed because we are not going today. A lot of times they don’t plow the parking lot right away and it is easy to get stuck unless you have a 4-wheel drive, which we don’t. BTW, Wolfie just came from outside and he is now pestering me and I know what that is about. A few hours later Marcy writes: Yes, we caved in. They finally shoveled our driveway and Bob happened to be still at home so, off to the dog park we went. We parked close to the street instead of close to the enclosed dog park. Didn’t want to risk it. You should have seen Wolfie gallop!! Also he does not poop in the backyard if he could help it so the first order of business upon reaching the park is pooping. Bob said we are totally enablers to this persistent weim. Well, we wish you a very Merry Christmas and a Blessed New Year. Breeder’s Note: For those reading this, please note (these wonderful people who are owned by Wolfie) are professionals–a doctor and a lawyer. They are not new to the breed either. 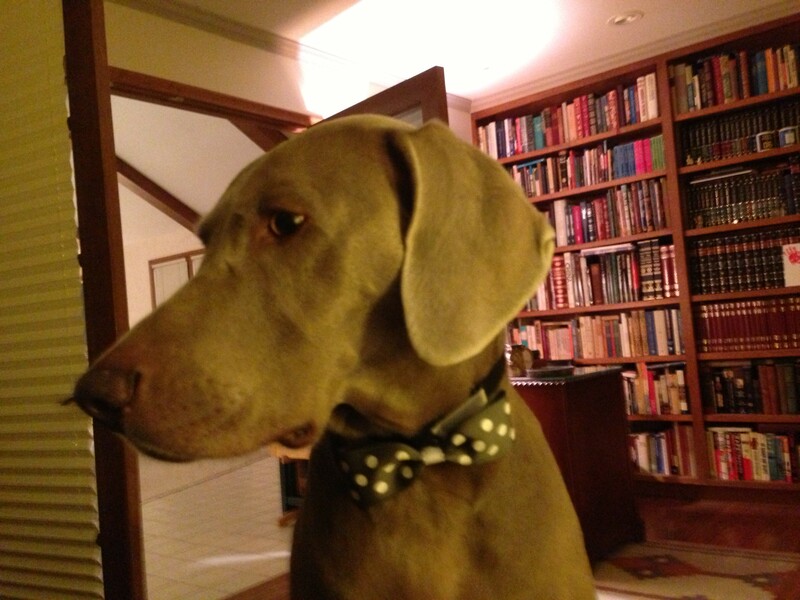 For those getting off to a start, please make a note to yourself that the concrete-thinking Weimaraner likes routine. However, when they get used to a schedule, a change can come at a huge cost. Many Weims will pester you to death. Some Weims will freak and become destructive. 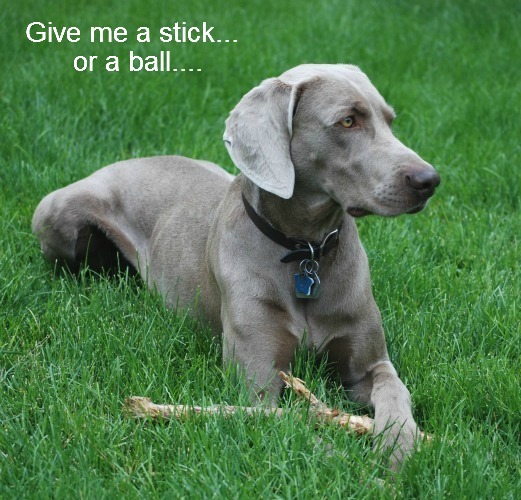 Another way to handle this situation is to teach your Weimaraner to be a bit more flexible. Do not make the dog park an everyday thing, or if you do–vary the time and route. Adjust your schedule a bit. Change when you eat, run, or whatever. Try not to do anything at the same time (or in the same way) habitually. Even moving their crate or food dish can be upsetting to some Weims. As you raise your puppy, you can implement small changes (such as moving the crate across the room or changing the feeding location), and help them become a bit more flexible. In the long haul, this approach would serve you and the Weimaraner well. Their concrete-thinking propensity can work to your advantage when training, but later can bite you (and them) in the back end if you know what we mean. Last week we sent you a photo of Wolfie bunny-hunting, and talked about him turning four years old. Here is one more of him resting after the “hunt.” Some days it is hard for me to tell whether he looks more like Rosie, or more like Dusty. 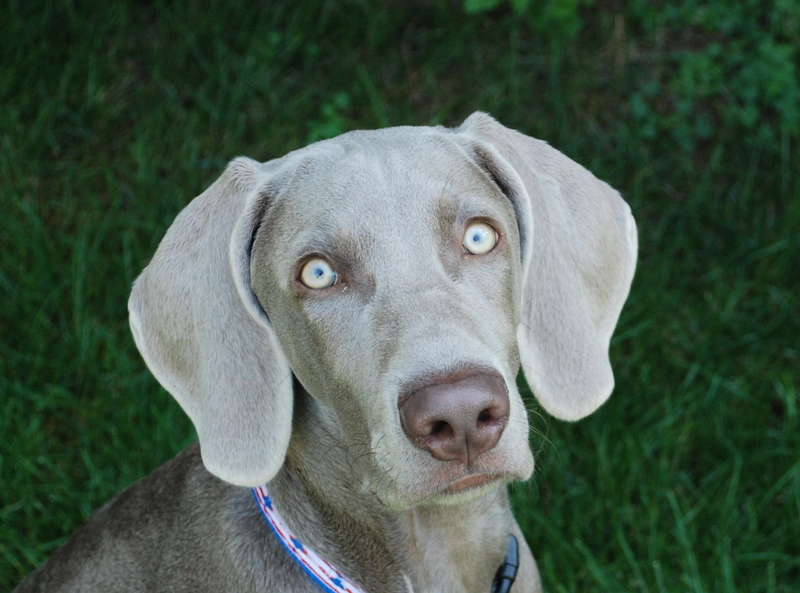 He is a nice looking Weimaraner, and the Rosie and Dusty mating makes for a handsome combination. April 8, 2012–We are off to the dog park to start off Wolfie’s 4th Birthday. 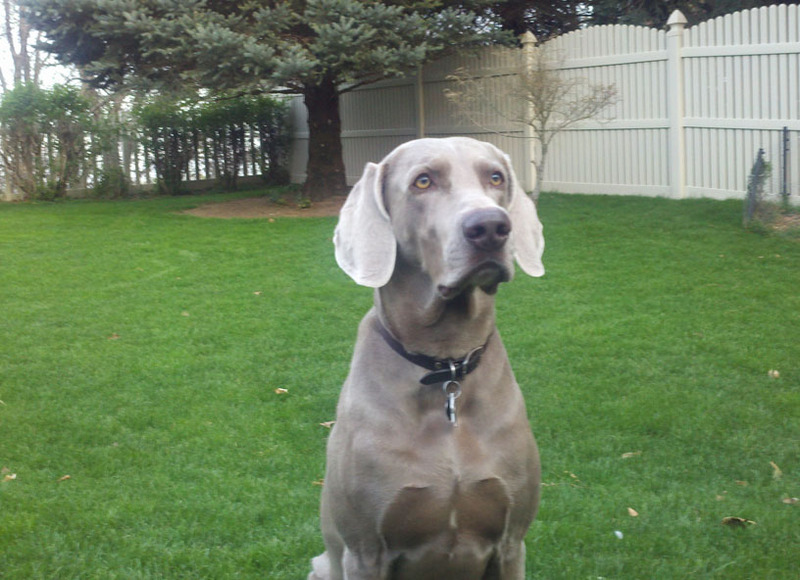 Thank you again for giving us the opportunity to share our lives with such a wonderful Weim. I will be making pupcakes today to share with his friends at the dog park and with neighbor dogs tomorrow. Week day schedule is more predictable as to when his friends will be at the park. Many don’t come on weekends because it can get crazy with so many dogs and owners. PS: The photo is of Wolfing hunting rabbits! Comments Off on Wolfie turns four! Who Could Ever Forget Wolfie?? More recently Wolfie had a bout with diarrhea. We all know this can happen, but it is never pleasant. Sometimes it can be scary because a bloody stool can make a person fear, there is something seriously wrong. Over several weeks Marcy worried about Wolfie. A neighbor dog had Giardia from eating critter pooh. Wolfie had more than one round of antibiotics. His appetite was off. To entice him to eat, they offered tasty morsels of liver and spoons of ice cream. Both are Wolfie’s favorites. Despite his lack of interest in food and not feeling well, Wolfie did not lose a lot of weight. Their Veterinary said he looked healthy and his weight was good. That helped Marcy to worry a bit less. I have put Wolfie on probiotics. I thought about your mentioning about the antibiotics he had been on, and I got to thinking that maybe his GI flora is out of whack. He has been on probiotics for 1 1/2 weeks now, and I think his appetite is coming back. His stool is still soft, but it does not look like cow pie anymore. The label on the probiotics said that full effect will be seen in three weeks. Wolfie is doing well, and he is eating (and his appetite is too good). His stool is nicely formed. I think the IBD is actually a reaction to the massive antibiotics he received. I will continue to give him probiotics because it appears to make a big difference. I am looking into various probiotics. I need one that comes in a reasonably large size and is readily available locally. I just wanted to let you know that Wolfie is healed (I believe). I’m trying to see if this will also cure his grass allergy. So far, so good. Breeder’s Note: Wolfie has a good life. As you can well see he is much-loved. His human Dad is a physician. Therefore, at the end of a long day it is important that Wolfie provides comic relief. On days when it is possible Bob joins Marcy and Wolfie in a trip to the dog park. Wolfie enjoys going to the dog park and seeing his many human and canine friends. Thank you Marcy for sharing with us. Let us count the ways these guys change our lives. Here is Wolfie after his awful encounter with a Rottweiler at the dog park. 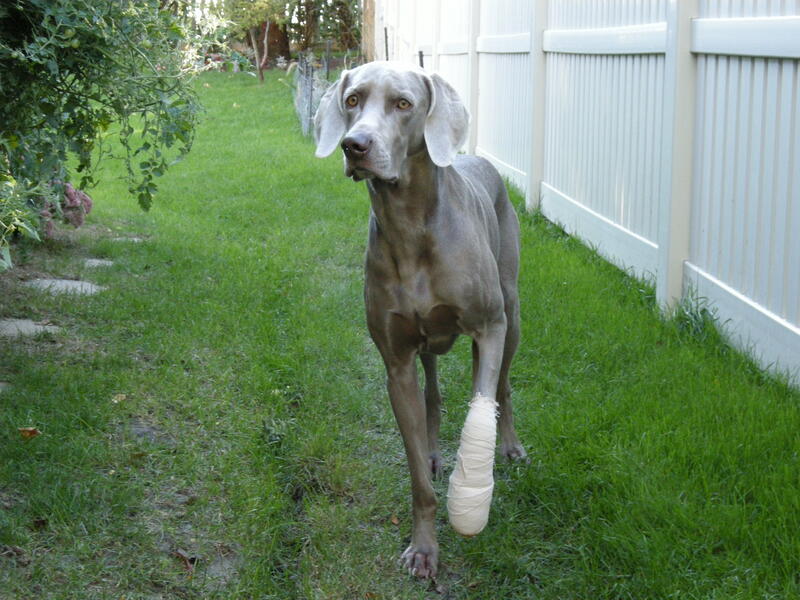 His paw was treated with antibiotics and was bandaged. Note: Check out our blog on Dog Park Dangers. Regarding Wolfie, his negative dog park experience has made him afraid of dogs he does not know and who have an attitude. If there is a dog he does not feel comfortable with, he starts whimpering. When he does that my antenna goes up and I just make sure he is far away from that dog. If it gets to be quite uncomfortable for him, as when the dog he is afraid of starts approaching him, we just leave the big dog park and go to the small dog park next door when there is no one in there. He is so relieved and happy when we go to the small dog park that he starts running and playing by himself. And now that the sun rises earlier and the weather is getting warmer, more of his friends have started going to the park again at the usual time. We have now been going to the dog park earlier also so he can be with his friends. It makes a lot of difference. We also say our prayers for a good park excursion before we leave the house. Today he ran with his friends and things were generally good except for a time when a black dog approached him and Wolfie got defensive. I just told the other dog’s owner to get his dog and make sure we separate them. So we stayed away from each other and Wolfie stayed with his friends and ran with them. Wolfie loves to be chased. Actually, after the guy took his dog to keep him away from Wolfie, his dog got into an altercation with another dog. So the other dog owners assured me that it was his dog that had a problem and not Wolfie. When we left, I just waved good-bye to the dog’s owner and he waved back. When Bob comes home from work, his first question is about our dog park experience for the day and how Wolfie did. So I have to give him a daily report on Wolfie’s park experience, except on weekends because then he comes with us to the park. Despite his occasional fear, Wolfie still looks forward to going to the park. If I am running behind, he starts taking clothes from the laundry basket and would run in front of me with the clothing in his mouth. If I ignore him. he’ll drop the clothing, go back to the laundry basket and take another piece of clothing until I start getting ready for the park. That is the highlight of his morning. Note: For many the dog park is the only place that is handy, off leash, and interactive. Most of the time they are safe but as Marcy has shared there is inherent risk. Some people and their dogs are not good citizens. Some people and their dogs push the limits. This causes problems much like a bully on a grade school play ground, however, there are no dog park monitors. The vast majority that use the dog park do so with good manners and rarely an incident. Nonetheless, Wolfie had a bad experience. This will color his view of the more dominant and aggressive canine visitors from here on out. We feel Marcy is smart in her approach to limit contact with these types. Wolfie is not going to back down if one of the small dogs is being bullied or they are trying to push him around. He may be upset, afraid, and intimidated but if attacked he will fight back. This could make for a bad situation for everyone concerned. Here are the previous links on Wolfie’s incident. Breeder’s Note: Not too long ago there was a bad incident at the Dog Park and Wolfie came out on the bottom with an injury to his foot. (Click here to read the follow up that posted on Wolfie’s recovery). One toe in particular was at risk. He is recovered although he may always show signs of the injury. Wolfie and his family live in Nebraska. Marcy makes an appoint to stay in touch with us and keep us posted on Wolfie and dog trends. We so appreciate her notes. 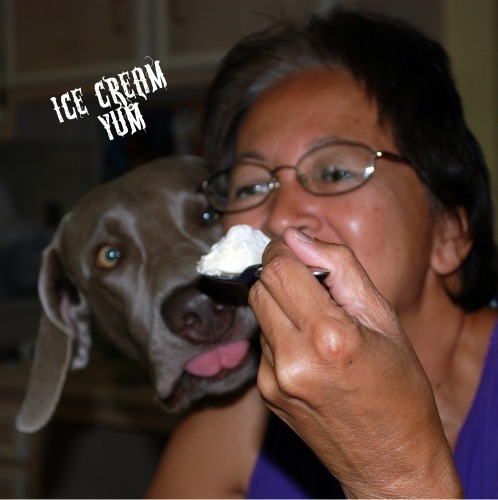 Her daughter lives in Texas and also has an OwyheeStar Weimaraner–click here to see Milo). Please read on to catch up on the latest regarding Wolfie and the things she sees at the dog park. Marcy Reports: Wolfie has been going to the park every day during the day and a leash walk in our neighborhood park and streets in the evening. He has his routine so that when we miss an evening walk for one reason or another, he wakes me up at around 3 AM to go to the bathroom. So, those evening walks are essential and so are his time at the dog park. One morning it was -10 degrees and it was cold but he still ran in the dog park with his coat on. On weekends we go early (around 7AM) to avoid the crazies and Wolfie is usually not even fully awake when he gets in the car. He yawns on our way there but as soon as we arrive, nobody could contain him. He is rearing to go and run, and run he does! But guess what? 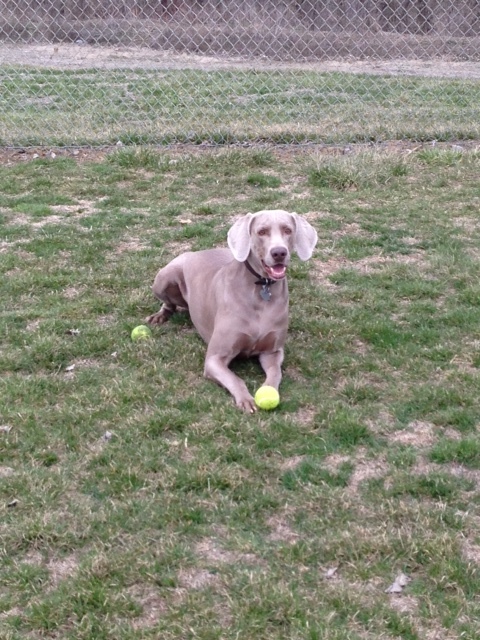 A lot of people have told me that Wolfie is unusually calm for a Weim, comparing him to the ones they see. I read your blog about those wanting breeding rights. (Click Here to read that blog. )That’s is quite upsetting. Actually when Wolfie and I were at the dog park, a woman came in with her kids and her male weim. Her purpose: to find a female weim for her male to mate. How sick is that? She actually came a few more times but I don’t think she was successful. Another bothersome experience was about another woman with her kids and her dog at the park. After Wolfie and I came in I started talking to her and found out that she was waiting for a family that was going to look her dog over at the park and see if they would want to adopt it. This woman does not know this family. She put an ad and this family responded and this was supposed to be their first meeting. At the end, I saw the dog get into the supposed adoptive family’s van. How sad! Comments on what Marcy saw at the dog park: It is our conviction that breeder’s must take responsibility for placing their pups in great forever homes. 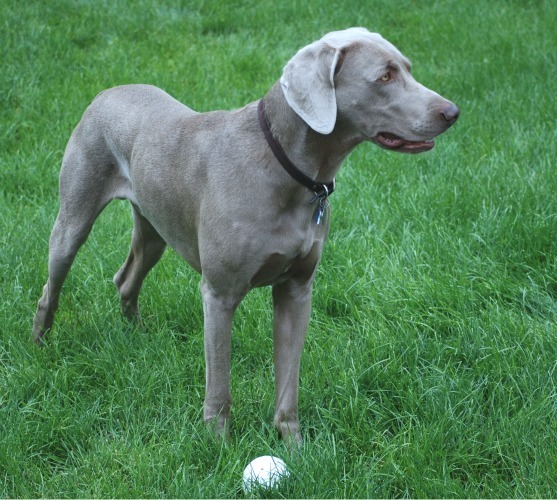 We understand that at times things happen that would in truth prevent keeping a pup, however, almost without exception the bulk of Weimaraner rescues happen because the person finds the breed too much. Too much can be grouped into various categories—too much work, too much exercise, too much trouble, too many problems. 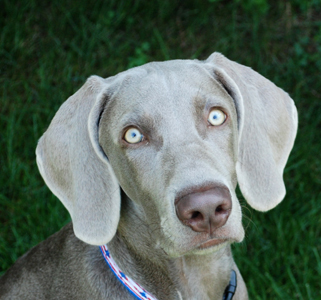 Most of these discarded or re-homed Weimaraner pups get into trouble because people or persons don’t understand the breed. Some think they are getting a Lab or other pointer because it is just another hunting dog. Understanding the breed and working with the nature of the fur family member is key to success with this breed. 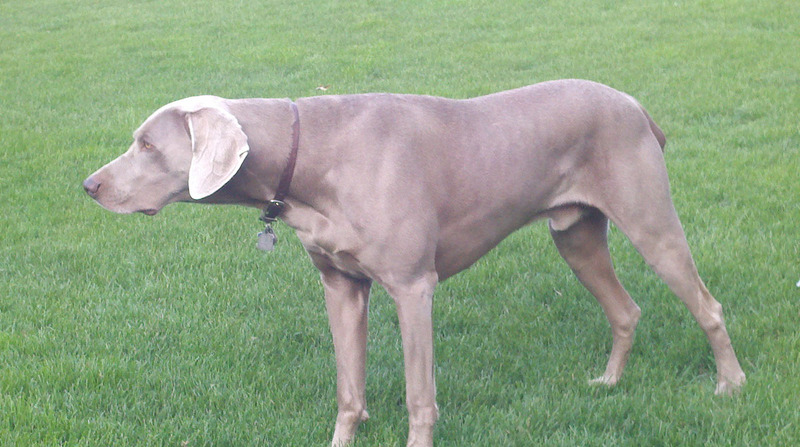 On another note, regarding the person looking to Stud their Weimaraner, this is truly just sad. It is sad on so many counts and it is such things as this that account for even more problems. Breeding the Weimaraner is nothing you do in a casual and flippant manner. Raising a litter to get your money back is old school. Raising a litter so your children can experience it is also old school. At times old school might be preferable but when you look deeper you realize that raising quality pups is expensive, time consuming, and requires an on-going commitment to the breed. Praise God for all His blessings! God heeded your prayers for Wolfie, one of His little creatures. The bandage came off today and except for a small area that has not totally healed, the prognosis is good. He decided not to rebandage the paw because he wants Wolfie to walk more on that paw. Whether or not he will have residual arthritis from the joint injury, we will not know until maybe five years hence. I told the vet that people are praying for Wolfie and he just smiled. He has been our vet for 16 years and he has seen us in very difficult situations especially towards the end of our first weimaraner’s life (Wolfgang Sebastian). This young one is Wolfgang Johann. Again, thank you for lifting Wolfie up to God in prayer. Diva Says………Please Pray for Wolfie! My 2 1/2 year old Weimaraner was bitten by a Rottweiler at the dog park last Thursday. I brought him to the Vet right away because his toe was bleeding. His foot was bandaged with antibiotics and was put on oral antibiotics. Last Sat. we removed the bandage and the toe did not look good. We waited a couple of days hoping it would get better. Today, I brought him back to the vet because his toe was still swollen. The vet rewrapped his foot with antibiotics and was put on a stronger antibiotic. The infection is in the joint and if the antibiotics does not clear it, they have to amputate the toe. Please pray for healing for Wolfie and that his toe will be saved. I know that with prayers, God will look kindly on him, one of His creations. Thank you so much for lifting him up to God for healing.